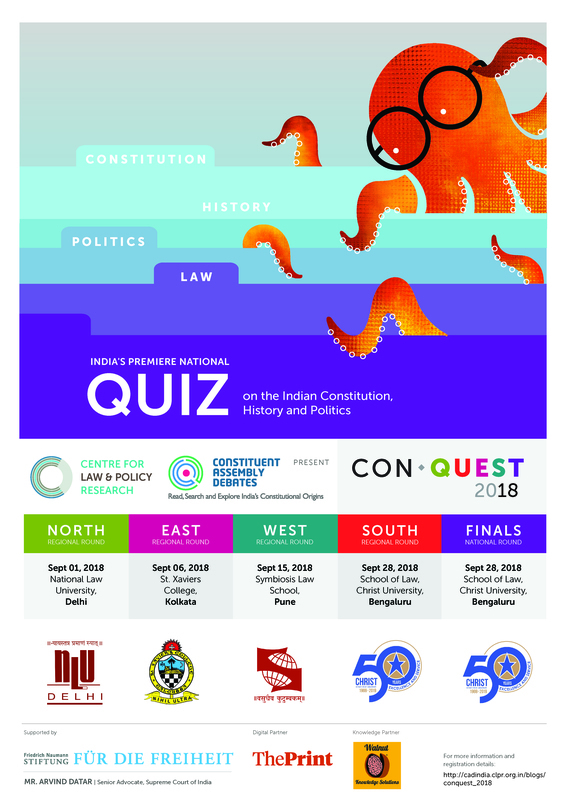 The Centre for Law and Policy Research (CLPR) is excited to announce the 3rd edition of ConQuest: India’s Premiere National Quiz on the Indian Constitution, History and Politics. Building on to the success of the previous editions of the Quiz, ConQuest 2018 will aim to further expand participation and deepen content. The Quiz will consist of four regional rounds (Delhi, Kolkata, Pune and Bangalore) and a national finals (Bangalore) in the month of September. ConQuest 2018 will encourage and facilitate students to engage with India’s rich constitutional tradition. It will draw on topics that include the Indian Constitution, law, politics, history and current affairs. It is open to undergraduate and graduate students from all disciplines. It will consist of four regional rounds and a national finals. Each regional round consists of a preliminary and a regional final round. Both will be conducted on the same day. The top two teams from each regional final round will compete at the nationals final to be held in Bangalore. What topics will the Quiz draw on? The Quiz will be broadly based on Indian Constitution, politics, law, history and current affairs. Please find the rules and regulations for ConQuest 2018 here. Spot registration can also be done at the venue of your regional zone (This closes half an hour prior to the start of the preliminary rounds). Please register online to allow the organiser to plan logistics effectively. ConQuest 2018 is an event that is organised under the Constitutional and Civic Citizenship Project. The project is supported by Friedrich-Naumann-Stiftung für die Freiheit . Prize Support: Mr. Arvind Datar, Senior Advocate, Supreme Court of India. Knowledge Partner: Walnut Knowledge Solutions.